Miste dig selv midt i de iskalde klipper, glitrende laguner og ærefrygtindgydende isbjerge af Perito Moreno Glacier på et uforglemmeligt helgedag eventyr fra El Calafate. 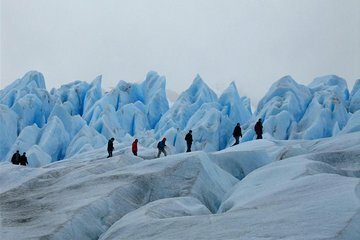 Venture ind i dybden af ​​den UNESCO-beregnede Los Glaciares National Park og nyd en fantastisk udsigt over gletsjeren i en 20-minutters krydstogt tværs over Brazo Rico. Tag udsigten fra gletscherbalkonerne og følg din guide på en 2-timers kreds af sydmuren. Denne mini-trekking oplevelse er ideel til mindre erfarne vandrere, med kun 1 times vandreture og kramper. 5 stars—for the actual on ice portion. The guides were terrific—friendly, engaged, appropriately concerned about safety, and informative. As good as any private tour I’ve had. The only downside was the pick up. The tour advertises itself as “small group” with pick up from our hotel. That’s not really accurate. The pick up was true—but it was a big bus and it took almost an hour to pick up all passengers and involved a lot of starting, stopping, and waiting. It was not what was expected. The return was better.All in all, however, I’d recommend this highly—if the pick up was more efficient, it would be 5 stars. The bus to the glacier was excellent as was our guide. The glacier itself is spectacular. The guides in the glacier are extremely knowledgeable and took excellent care of us pointing out both the dangers and beauty of glacier hiking. It was a great experience. The guides were great and very helpful. Although my wife was a bit reluctant at the beginning our guide was wonderful with her and trek was a bucket list experience for both of us. The views were astonishing. We were fortunate to be there the day the water started through the bridge so the ice falling while we were on the balconies was ideal. Great tour. Well worth it. Pros: Amazing experience hiking on the glacier with knowledgable guides who spoke good English. Great views of Perito Moreno Glacier from the main balconies in the park as well. Cons: Terrible communication of the schedule prior to and during the day of trip. Having to change buses multiple times between pick up and making it to the start of the glacier trek is confusing and wastes time. There was also no mention of the fact that we would go to the balconies after the trek - it was great to get to be able to do this, but was disorienting as we thought we were heading back to El Calafate but in reality we were still three hours from the end of the day. Overall: Totally worth doing for amazing views and an amazing experience. Be prepared to just go with the flow.